Asda is encouraging customers to pay for Christmas in one of the most expensive ways possible, by withdrawing cash on its credit card, which costs at least £5 a time. 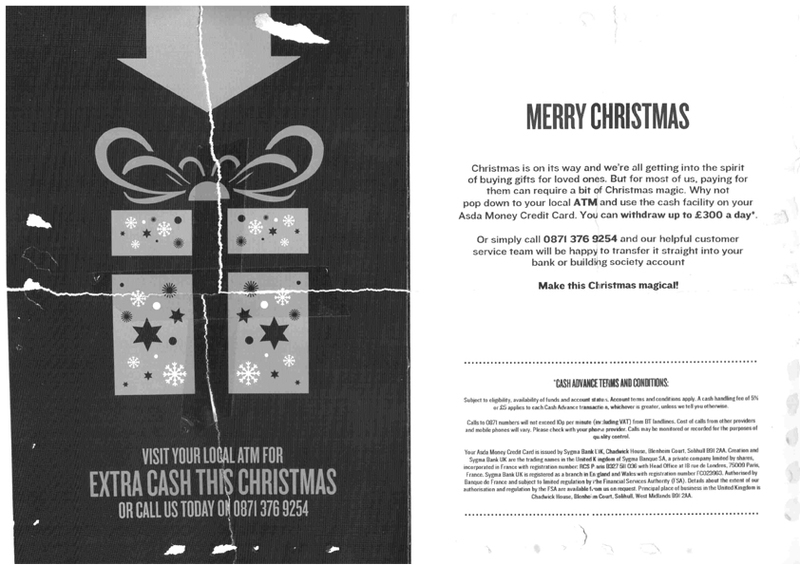 Customers of the supermarket's banking arm, Asda Money, were sent a flyer last week in the form of a Christmas card. As part of its ruse to push users into taking out cash, it said paying for gifts can "require a bit of Christmas magic". But not only are charges for using credit cards in ATMs huge, interest is unavoidable and it can also affect credit ratings. Asda told customers: "Visit your local ATM for extra cash this Christmas... why not use the cash facility on your Asda Money Credit Card. You can withdraw up to £300 a day." The flyer was sent by the firm that issues its plastic, Sygma Bank, which also trades as Creation. Asda says the same message went to customers of other cards issued by the firm. Creation runs the Flybe, Marriott and various football clubs' credit cards. There are two reasons why you should always avoid using your credit card for cash. But these negatives are not all disclosed in the flyer, which also contains inaccuracies. Huge charges. For cash withdrawals, Asda Money charges 3% of the amount taken, or £5, whichever is greater. The flyer says there is a charge — but it claims it is 5%, or £5, so is wrong. Instant, unavoidable higher interest. While the standard APR Asda touts is 14.9% for purchases, on the same card, if you withdraw cash you'll pay vastly more, at 27.9% APR. Worse, while normally if you pay off a credit card in full each month you are not charged interest, when you take cash, you pay interest even if you fully repay as there is no 'interest free period'. You pay interest for every day the debt is on the card from the point you withdraw until you repay. Yet Asda's flyer doesn't mention this – only the cash withdrawal fee. Taking out £100 on an Asda Money credit card, paid back 30 days later, would cost £7.30. MoneySavingExpert.com money analyst Helen Saxon says: "This is an irresponsible piece of advertising from Asda, especially at a time when many people want extra cash. "For one, you should always avoid taking cash out on a credit card as it's mightily expensive. "But what the leaflet doesn't state is the unavoidable interest." Click on the thumbnail below to see the offending flyer. To rub salt into the wound, Asda also suggests customers call a 10p-a-minute premium rate line to transfer money from their credit card to their current account, if a withdrawal is not for them. Update 2.30pm: Asda has now issued a statement on its website apologising for the flyer. The supermarket is investigating how many customers the flyer was sent to. An Asda spokeswoman says: "We always want to offer the best products and services, but we'd never want to encourage anyone to get into financial difficulty. "This message has been sent direct from the card issuer and we're looking into it at the moment. We're very sorry to anyone who has received this and thank MSE for bringing it to our attention." As well as high charges, too many credit card cash withdrawals can harm your credit rating, making you less attractive when applying for future credit. James Jones, from the Experian credit crating agency, explains: "In isolation, a cash advance is not a problem. But regularly, or if accompanied by missed payments, it might raise eyebrows." The flyer may even break Office of Fair Trading regulations. These require any credit card adverts, including flyers, to state "the annual rate of interest, any non-interest charges required to be paid for the credit, and the amount of credit".